Welcome in the New Year! As I write this, this year has 8 hours left to go before it slips into last year taking all its happenings with it. Like any year, the new one ahead promises so much: 12 big fat months to learn, explore and experiment; 12 months to move forward, or sideways, to downsize, or move on; 12 months to raise chickens, make cheese, press oil, ferment cabbage; 12 months to do all those things that you promised yourself you’d do this time last year. Oh yeah! There’s nothing wrong with dreaming but now is the time to ditch regrets and dump baggage: 2015 awaits and there’s a whole lot of living to do! I can never work out whether celebrating the last day of the year is more fun than celebrating the first day of a new year – it generally depends on what ungodly hour my head hits the pillow after seeing in the new year. But once I’m up and pottering, tea and toast won’t cut it – I’m after the full monty combo of carbs, fat, salt and chilli. It’s the best way to clear the cobwebs I reckon. 1 Put onion in a medium frying pan (skillet) with oil and cook gently until tender but not coloured. Transfer half the onion and most of the oil to a saucepan and set pan over a medium heat. Heat onion, then add cumin and paprika, stir, then add tomatoes. Bring to a gentle boil, then lower heat and cook gently for about 15 minutes until pulpy. Season with ¼ tsp salt. 2 Drain beans in a sieve, rinse well, then drain again. Add beans and chilli sauce to onion remaining in frying pan (skillet) and cook very gently for 3-5 minutes, mashing the beans a little. 3 Halve avocado, remove stone, then peel. Cut into cubes and drizzle with lime juice. 4 Toast tortillas in a hot, dry frying pan (skillet) for a few minutes a side, or wrap in paper towels and warm briefly in a microwave. Put tortillas on plates. 5 Fry eggs in hot oil, spooning some of the hot oil over the egg whites as they cook. 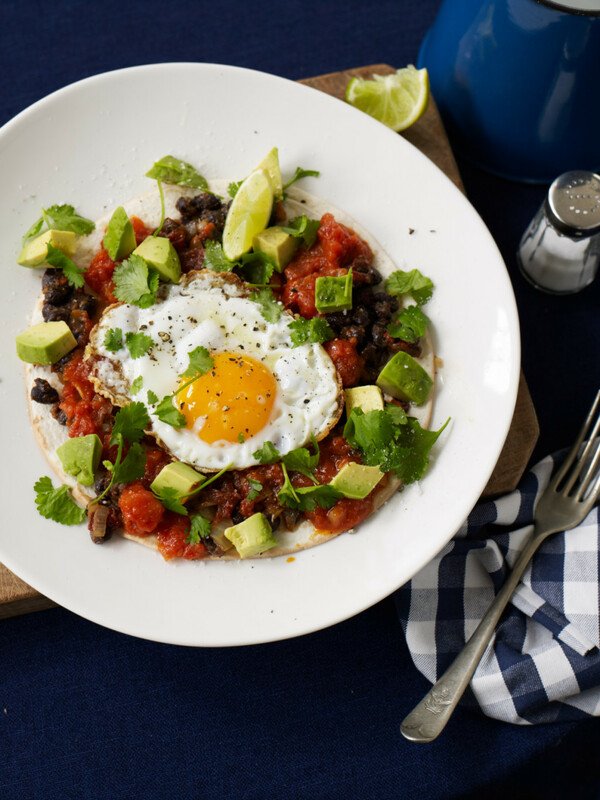 Spread beans on tortillas, add tomato sauce in blobs, then put fried eggs on top. Season eggs with sea salt, add avocado around the sides and sprinkle with coriander. Serve immediately with lime wedges.